GSFE-surface of the (111) plane of a gamma-type single crystal. The main shearing directions are indicated. Reprinted from Acta Mater. 106, 208-218 (2016) with permission from Elsevier. The interfaces in lamellar TiAl alloys have a strong influence on the strength and deformability of the microstructure. It is widely accepted that their number and spacing can be used to tune these properties. However, the results of molecular dynamics simulations of sliding at g/g interfaces in lamellar TiAl alloys presented here suggest that important factors, namely the sequence of different interface types as well as the orientation of in-plane directions with respect to the loading axis, have to be included into meso-scale models. Simulations of bicrystal shear show significant differences in the deformation behavior of the different interfaces, as well as pronounced in-plane anisotropy of the shear strength of the in-dividual interfaces. 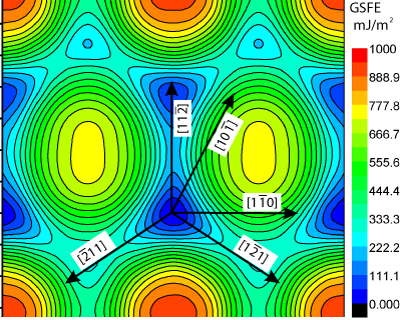 The critical stresses derived from bicrystal shear simulations are of the same order of magnitude as the one for nucleation and motion of twins in a g-single crystal, showing that these mechanisms are competitive. In total four different deformation mechanisms, interface migration, twin nucleation and migration, dislocation nucleation, and rigid grain boundary sliding are observed. Their occurrence can be understood based on a multilayer generalized stacking fault energy analysis. This link between physical properties, geometry and deformation mechanism can provide guidelines for future alloy development.